"The most challenging, stressful, and exhilarating session I've ever done" is how I usually describe it. Distilling 300+ musicians on stage down to 32 tracks was the first challenge. The adult choir, madrigal choir, children's choir, full symphony orchestra (with enhanced percussion of course), rock drums, bass, and guitar, country fiddler, harmonica, harmonium (a favorite of Bill's), and 8 soloists in various styles made up the ensemble. Oh, and the pipe organ (but there's another story there...). 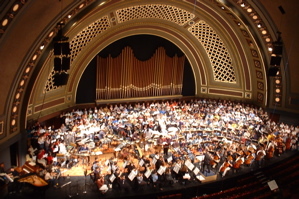 We set up a control room with surround monitoring capability (Mackie HR824s) in a second-floor dressing room in the venerable Hill Auditorium, Ann Arbor, on Monday and Tuesday. Wednesday, we started recording the dress rehearsals preceding the Thursday evening live performance. 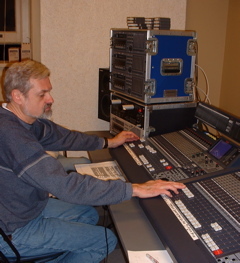 4 Tascam DA-78s sync'd at 24-bit from tandem Panasonic DA7s allocated each mic to its own track, and facilitated a live stereo mix for reference CDs for producer Tim Handley and conductor Leonard Slatkin. Rolling through rehearsal, the 2 1/2 hour live performance, and pickup sessions all day Friday and Saturday, we generated a very tall stack of DTRS tapes and a multi-page log.